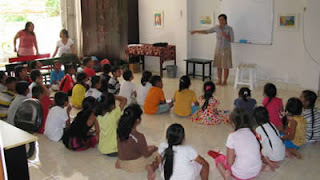 I’m happy to report to you that our Bali Training Center English language and Computer training programs are running smoothly and have exceeded any expectations we may have had regarding participation by the local village children. 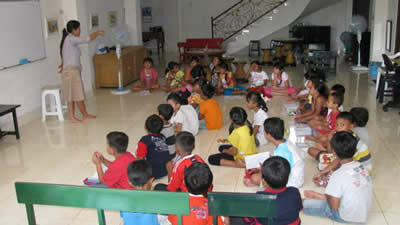 Officially starting with 28 children in April, we have grown to 87 registered children attending classes now. 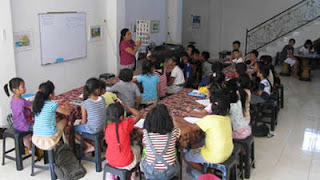 We have faith that we will be able to meet the additional monthly expenses necessary to hire teachers. Nearly two years ago, after witnessing how difficult life is here in the surrounding rural villages for senior abandoned wives and widowed women, I began helping an older Hindu widow buy food, medicine and personal care items. That simple donation of $5 a week from my personal funds grew to supporting 13 older women in 2012 and that support continues today. 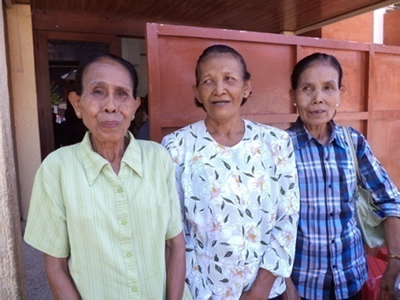 I have nearly used up my personal savings when furnishing the Training Center and supporting other ministries over the years including these deserving widows. I want to visit the U.S. to register my wife Tati with the Social Security Adm. . If we could find another way to continue the widow's support, I would save $260 a month and be able to apply those funds towards the purchase of Airline Tickets. These women are our family now. It's such a joy to be able make life a little easier for them in their declining years and they are so humbly grateful. If you are willing to support the Widow's Ministry please notify me by email, so the support is not used in the children's general fund. The best way to keep track of the kiddos….. is by the shoe trail. It’s events like these that have built our Faith and led us on into the unknown plans He has for us……. 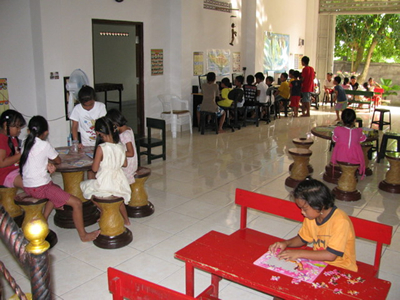 allowing AHFC to create a beautiful “Oasis of Care and Learning” in a village on Bali Island and to be able to support orphanages and a day care center…and to provide funds for children’s hospital and educational expenses and funding for the rescue and placement of unwanted children….all because of your faithful support. What a joy! 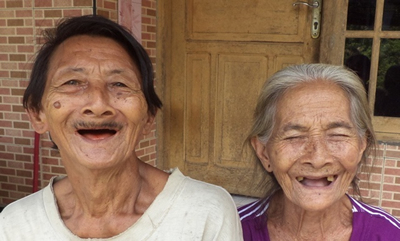 One of the widows we support……… smiling for the camera with her visiting brother. 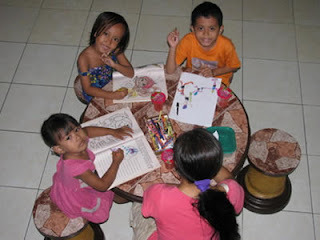 We do not use donated funds to assist these needy older women because A Heart For Children follows our basic principal that 100% of all donations goes to support the children we care for. Thank you all for your encouraging e-mails, your prayers and your generous financial contributions. The best time to view is from 5 pm to 7pm PDT that’s 8 to 10 am in Bali. All dressed up and attending Church. These 3 widows live in a remote village compound 20K away.They raise pigs on the land owner’s property in exchange for food and a small sleeping room. Once a week the church bus picks them up and brings them to Klungkung for Sunday services. When we first started supporting them they said this is the first time in 15years that they had any money. They, like most of the women we help cry openly when we give them support… so we are careful to conceal our giving. It’s such a blessing to be able have this ministry. The rewards are immediate and lasting. Do any of you recall the movie Field of Dreams? Basically, it was the story of the building of a baseball playing field in a farmer’s corn planted acreage. The inspiration for the builder of the project came from unknown voices that repeated the phrase... Build it and they will come. There is a striking similarity from the format of that movie with our Children's Training Center here in Bali. With the financial help and prayers of our loyal supporters, A Heart For Children's Vocational and Educational Training Center has been built….. and the children have come! ... And we know the source of our inspiration. To see our dreams and visions come together after nearly 3 years of concentrated effort and to witness the impact we have made towards the positive growth of the children and the families of our local community has been a real joy. We now operate a Dept. 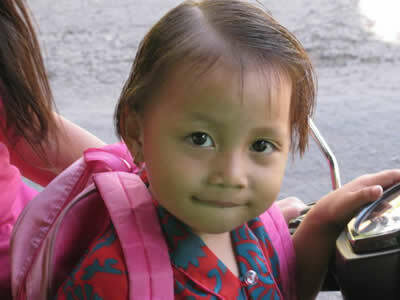 of Education licensed Kindergarten 2 hrs a day 6 days a week serving the local children from poor families. These children's families were unable to pay the $5.00 a month Gov. fee to attend school. AHFC's School now pays those fees and also feeds the Kindergarten children a morning meal during their class break time....... usually eggs or meat and milk,....food they rarely ever have,... along with their rice. The average class size now is 12 students and growing. However, we cannot bask in achievements of the past, for we realize that there are many facets of our operation and programs that need development and improvement. 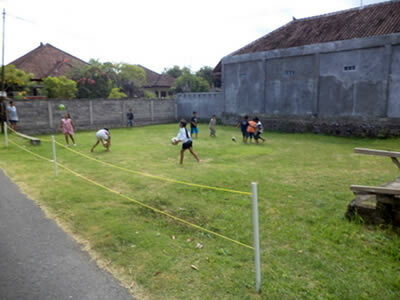 Unlike the U.S.A. when it comes to volunteering....in Indonesia, for every task preformed compensation is expected. 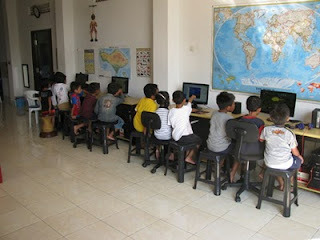 In order to keep the English and Computer teachers we need for our existing and future classes and to expand into our planned vocational training, we will need to pay our staff an acceptable wage. The Kindergarten class costs $100 a month for fees and food. 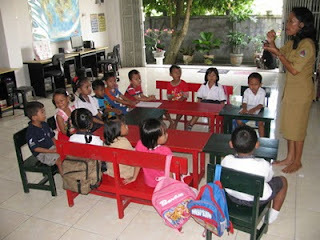 The Kindergarten teachers are paid by the Bali Government. 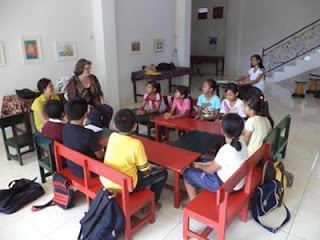 We are paying the teachers for the 2 Elementary School and 2 Jr. High School English and Computer Classes $280 a month. 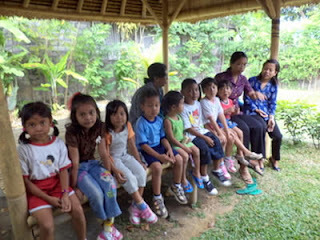 We are reaching out now for financial support of $4,560 to cover these expenses for the next year. We thank you all for your generosity and prayers which allows us to fulfill the Great Commission……at this time with few words but with extraordinary deeds, demonstrating His loving heart for children. 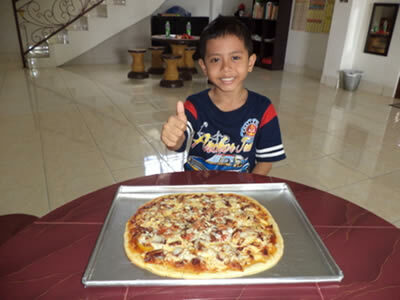 1st Pizza from our new cooking class oven, Thx. Debora. Kindergarten class in Hindu ceremony attire. 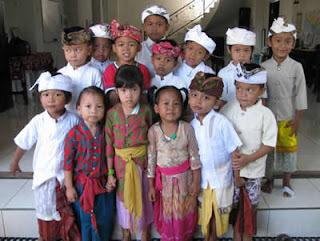 All of us at A Heart For Children in the USA and in Bali, Indonesia hope your Easter was uplifting and personally meaningful. 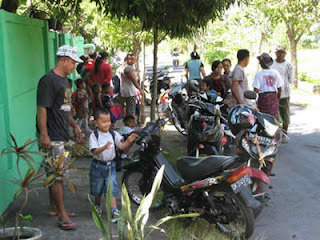 Here in Bali, we have had many memorable moments in the past few months. We had the opportunity to meet and greet baby Anne, the child who's rescue A Heart For Children sponsored at the end of last year. 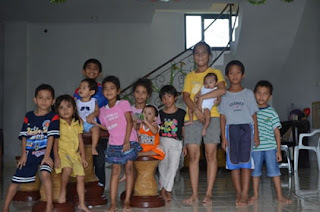 Also spending 4 days at our Training Center were baby Anne's 4 brothers and 3 sisters from Mothers Heart Orphanage and children from Singaraja in north Bali Island. 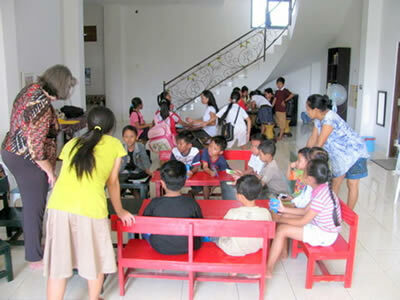 Last month, I visited a children's day care center located not far from our Training Center here in Klungkung. Our Bali organizations chairman Bagus and I went there to pick up his 1 year old daughter, who had been dropped off for the first time earlier that morning. 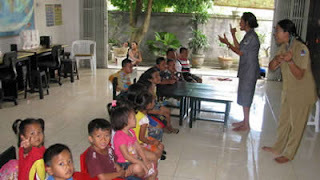 The day care center was clean and the owner seemed competent, having been a midwife until retirement… but they, like most child care facilities, are very poor. Inside, there were 8 children from 1 year to 2 years old in several rooms lying on blankets that were on the floor. 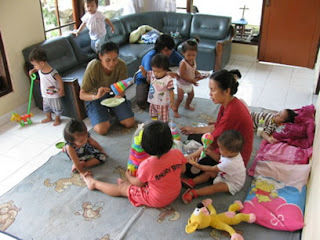 They were all in diapers and had formula bottles in their mouths or near-by. It was extremely hot and humid in the rooms. The striking thing was that there were no toys... no stuffed animals or dolls...no objects of any kind for them to touch or observe except their bottles. There was nothing on the walls for them to look at to stimulate their natural inquisitive minds. You guessed it... how could we not provide a rotating fan, some stuffed animals, simple educational toys like colored plastic stacking rings of various sizes.... some pull toys, colored building blocks and a large covered rolling toy chest to store it all in. The topper is... now when the parents arrive to pick up their children, they sit with their young kiddos and play with the toys together. Ibu Agung, the owner, is so grateful she cries and tries to kiss my hand whenever she sees me. 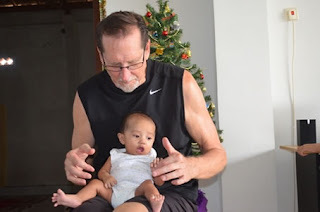 These are the humbling moments of our ministry ....that I wish you all could witness...I just point to the sky and say, "It's not me, thank God and the people in America who support the work we are doing here in Indonesia."